Mr. Market is looking forward to increased infrastructure spending and hoping that it will boost industrial fortunes, but investors may want to be cautious. Shares of leading heavy equipment manufacturers jumped between 11.7% and 16.2% last month following the results of the presidential election as investors expect big plans for infrastructure spending to boost growth in the next few years. The group was led by one of the segment's flagship companies, Caterpillar (NYSE:CAT), with Ritchie Bros. Auctioneers (NYSE:RBA) and AGCO Corporation (NYSE:AGCO) not far behind. Most of the monthly gains came in the two days immediately following Election Day, as investors cheered Donald Trump's promises for massive infrastructure spending. Ironically, infrastructure was perhaps one of the only issues the major party candidates agreed on, so industrial equipment stocks may have enjoyed a boost regardless of the result. Caterpillar led the group with a 16.2% gain in November, its best single month for the year. The stock is now up 40% year to date and has added a remarkable $16 billion to its market cap this year. Ritchie Bros. Auctioneers and AGCO Corporation have gained 58% and 30%, respectively, in 2016. However, there are signs that investors are getting ahead of themselves. While there does seem to be broad agreement among politicians across the aisle that America could use an infrastructure upgrade, the details will take some time to work out. In addition to sourcing funding, "infrastructure" is an awfully broad term. Consider that the American Society of Civil Engineering releases an Infrastructure Report Card with 16 different categories ranging from energy and ports to bridges and levees to schools and wastewater. (America's last overall infrastructure grade, released in 2013, was a "D+".) Caterpillar and its heavy machinery peers are uniquely positioned to benefit from broad upgrades, but if certain categories are prioritized, then they could be on the outside looking in. Management at each company is aware that their near-term prospects won't be driven by loose infrastructure plans at the national level, but global headwinds weighing down on commodity markets and currency exchange rates will continue to put downward pressure on the industry. Caterpillar still expects to see lower revenue and profits in 2017, but a market-beating dividend yielding over 3.2% should keep long-term investors happy. Meanwhile, Ritchie Bros. Auctioneers has managed to grow revenue 10% in the first nine months of 2016 compared to the year-ago period. That's mostly attributable to its smaller size -- Caterpillar is 14 times larger -- and several acquisitions that are driving growth. It's still feeling market headwinds, as evidenced by a 28% drop in diluted EPS during the comparison periods, but regional auctions are a little more insulated than -- and could even have an advantage over -- original equipment manufacturer sales. AGCO Corporation, which primarily sells agricultural equipment, has not been as fortunate. Sales volumes of tractors and combines are down in all three of its major markets in the first nine months of 2016 compared to the same period last year. The only growth in the category is a 1% increase in tractor sales in Western Europe. Other than a 5% drop in combine sales in South America, all other segments are down by double digits. Revenue is essentially flat during the period, but EPS has shrunk by 35%. 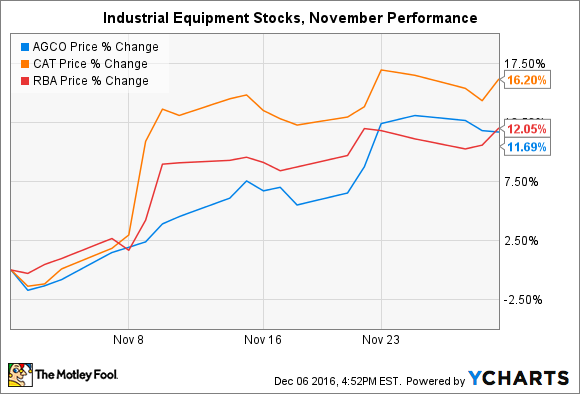 I'd be curious to see if any analysts called it last year, but industrial equipment stocks have actually been one of the best performers the stock market in 2016. The caveat is that most ended 2015 on a sour note and near multiyear lows as investors worried about global headwinds. For instance, while Caterpillar has risen 40% in 2016, the stock is still well below levels enjoyed during all of 2014. Although there are signs that commodity markets are improving and currency headwinds are abating, they promise to linger into 2017 and perhaps beyond. Therefore, I would take a cautious approach to these stocks and not expect an encore performance next year.